Thieves who broke into a football stadium and stole giant TVs raided fridges to stage a food fight with frozen cheesecakes. 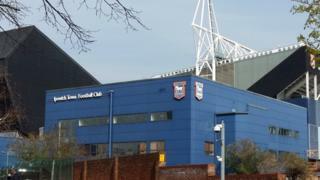 Police said the break-ins at Ipswich Town Football Club's Portman Road ground took place overnight on Saturday and in the early hours of Wednesday. During the first raid, the intruders partied on wine and food, the BBC understands. A club spokesman said they have increased the stadium's security. It is understood the thieves got into hospitality boxes - one next to chairman Marcus Evans' personal box - and helped themselves to "expensive vintage" wine and food. They then took the lift down to the kitchens beneath the stands to raid the fridges. The same gang of at least four people carried out the raids on both occasions, it is understood. Suffolk Police said officers were called to the ground at 07:50 BST on Sunday and at 06:00 on Wednesday. A number of plasma television information screens from public areas around the ground were stolen on the gang's second visit, it is understood. Police said no arrests have been made and inquiries are ongoing. An Ipswich Town spokesperson said: "We can confirm there have been two incidents over the last week of intrusion at the stadium. "The police are aware and are investigating. We have increased our security as a matter of course."